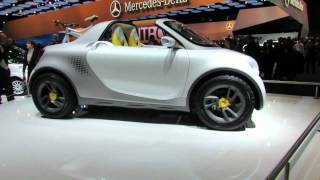 Smart unveiled a urban mobility concept car at the Detroit Auto Show - the Smart-For-Us. Smart-For-Us is targetted for the younger generation while limited the road space consumption. 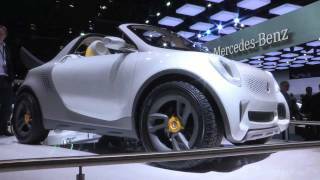 The car is powered by a 55 kW magneto-electric motor, the same electric drivetrain as the Smart Fortwo (to be launched in spring 2012), which gives a max torque of 130Nm and can push the smart-for-us to a max speed of above 120km/h. The lithium-ion battery driving the magneto-electric motor can be fully-charged in 8 hours using regular electric socket. Stuttgart/Detroit. America is the land of great automotive freedom, great landscapes, a love of outdoor activities and large pickups for thoroughly enjoying the "American dream. 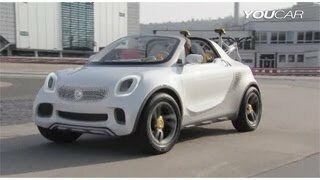 Now smart is countering the "bigger is better" mentality with a surprising new vehicle: the smart for-us study is small, agile and does not need any petrol thanks to its electric drive. This model, which builds on the smart forspeed and smart forvision concepts presented in 2011, will celebrate its world premiere at the North American International Auto Show in Detroit (14 - 22 January 2012). With its exterior dimensions (length/width/height: 3547/1506/1701 mm) it could almost go unnoticed on the loading area of a typical pickup, and it also anything but ordinary under the body. smart is turning the automotive world upside down once again and challenging ideas about what an urban pickup should look like. In a tongue-in-cheek manner the for-us signals that this is the right car for the young and young-at-heart with active lives who attach importance to low emissions and taking up minimum road space. The smart for-us translates the practical loading concept of a pickup to the reality of 21st century urban traffic for the first time. Thanks to the state-of-the-art electric drive with a 55 kW magneto-electric motor the zero-emission smart for-us is agile and lively to drive. Like car2go, the globally successful car sharing initiative from smart for more flexibility in city traffic, the smart for-us is a mobility concept. Just like the smart fortwo, which has enjoyed success around the world, it has ample room for two people, but it also has space behind for two smart ebikes, which can charge their batteries on the cargo area during the journey. From a trip into town to an outing to nearby nature reserve – the smart for-us safely transports two people and two electric bikes without producing any emissions. The ebikes on the cargo area become range extenders in two respects: thanks to the docking station on the cargo area of the smart for-us their batteries are always charged, and smart for-us drivers can also reach destinations that are out of bounds for cars – for example traffic-calmed zones in the city or isolated park trails. The for-us is raised by 50 millimetres as against the standard smart, and demonstrates that it is perfectly suited to off-road driving, for example to reach mountain bike terrain. In a later development stage the electric drive could be extended in the direction of a 4x4 with two front wheel hub motors. 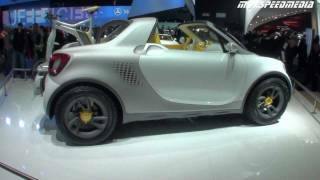 The high-gloss white metallic paintwork of the smart for-us with the tridion cell in a grey textured finish also builds a bridge to the smart forspeed presented at the 2011 Geneva Motor Show, and to the smart ebike. 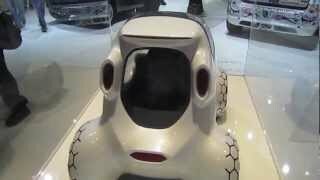 On the other hand, the honeycomb structure of the air inlets takes up an aspect of the smart forvision, which attracted lots of attention at the Frankfurt Motor Show in September. The subtle colour accents in a warm yellow establish a further visual link to the interior. The study has yellow seat covers with a deep embossed silver hexagon pattern indicating a progression and thus emphasising the vehicle's dynamism. As the covers can be removed in no time at all, simple individualisation with other throws is conceivable. The seats could even be used as avant-garde seating at home or when spontaneous seating is needed outdoors. smart's high technological standards are manifested in the extremely efficient and high-performance drive package. As a "pedelec" (Pedal Electric Cycle) the smart ebike is strictly speaking a hybrid: the electric motor – a maintenance-free and brushless rear-wheel hub motor from BionX – switches on as soon as the rider starts pedalling as with a normal bicycle. Muscle power is transmitted to the rear wheel via a durable and quiet belt drive. An integrated three-speed gear hub provides for simple gear changing.